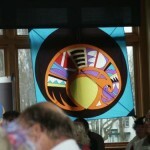 This year I had the pleasure of attending the 22nd annual Fort Worden Kitemakers Conference. 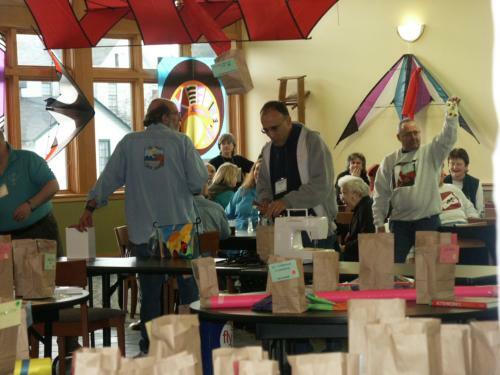 Last year I won a scholarship at the Whidbey Island kite festival, and then was shocked when they called my name as a winner in the feedback raffle. After a challenging sewing machine experience last year, I was determined to bring something home sewn by my own hands this time around. On Thursday afternoon I picked up a rental car and was anxious to be on my way. Having arranged to leave work early, I was back in the rental car on my way home by 2:30 p.m. to pack and start in on my four-hour drive. By 4 p.m. I was on the road. The Chrysler Sebring, I scored from the rental agency was a nice ride so it made the trip smooth. Arriving at the fort around 8p.m., I went straight to check in. The Fort brought on a pleasant nostalgia, as I was filled with the warm memories of last year’s experience. Greeted by Bob Alford, I was given my registrations packet and dorm room key. Taking a peek at the raffle first (always a big treat), I made my way over to the dorm for some much needed rest. I was on the opposite side of the dorm rooms this year, which was neat because of the water front view which provided some amazing sunrises during this visit. When I walked into the dorms there was a fabric sale going on! Rolls of ripstop were being stretched across the floor and being sold at the bargain price of $1.50 a yard. How could I resist! I put in an order for a few yards in order to encourage me to keep sewing, and then continued to unpack my car. Oh, there is nothing like the dorm rooms. You have your desk, window, chest of drawers, closet, and 5 1/2 foot bed, and that was it. It takes a minute to adjust to the fact that the bathroom is down the hall and that you must not forget your room key when you go there. I said my hellos to familiar faces and went to bed pretty early. I had forgotten my alarm clock again this year; thank goodness cell phones come with alarms on them. I set my cell phone alarm and settled into bed. The lounge area was full of people who hung out until I am not sure when, as nothing was going to keep me awake that evening. This morning I woke up early and got into the community shower before the line started. Breakfast was served at 7 a.m. and you always want to make certain to get there in with enough time to buy tickets for the raffle and see what they are giving away at that meal. The sunrise this morning was beautiful. As I walked out of the dorm there were many people gathered by the water watching the sunrise. I myself could not resist taking a few shots of it. 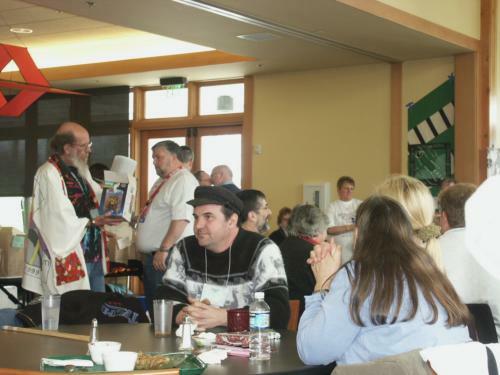 I wandered in for breakfast and began to see familiar faces and friends. Sitting with Allen and Marjorie Taylor, I had the pleasure of being introduced to the woman who won the scholarship from Whidbey Island this year, Sam Felty, whom I found out would be in the same class with me in the afternoon. There would be raffles held during each of next 6 meals during this event. 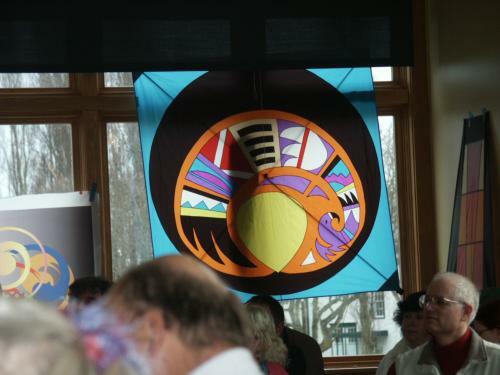 Marla Miller “thanked you for shopping at the Fort Worden Kitemakers Conference” and encouraged you to return. The raffle team was amazing. They kept things moving along as Steve Millspaugh announced the winners. Some of the special items they give away every year include commemorative Fort Worden pins (there were 6 of them and are a treat for any collector). After breakfast most people wandered off to their classes. Having no classes on this particular morning, I decided to use the opportunity to take a peek at some of the other classes that were going on. 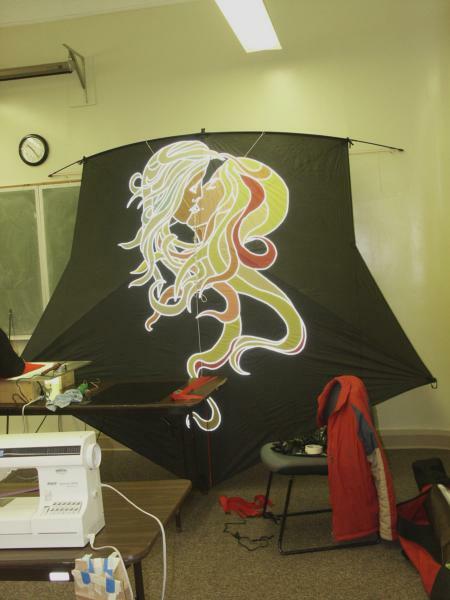 The first class that I wandered into was Mary Bos’s bed sheet kite class, which was going on in the Seminars building. I noticed a few familiar faces and said my hellos to Mary and Rhonda Brewer. 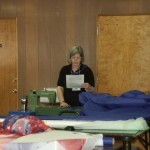 Mary, remembering my sewing machine fiasco from last year, let me know that she had Pfaff and was not going to be using it this weekend. I let her know that we’d know the fate of my machine after this first class, and thanked her for the offer. After seeing what they were doing there, I made my way into the schoolhouse. It’s really hard to be subtle when you are walking around with a camera on your shoulder that has a flash, but I decided to see a couple of more classes anyway. 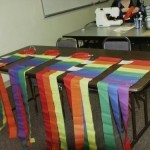 Walking into Gerry Pennell’s Beginning Sewing class (which I had the honor to participate in last year), I found them working on the rainbow windsock as you can see among my photos. 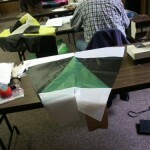 Gerry makes it really easy to accomplish your first kite project and shares her knowledge with beginners quite easily. 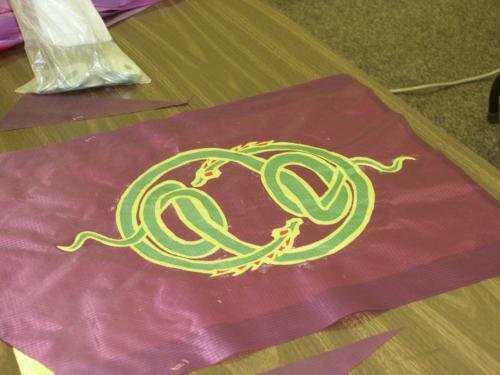 The last class I had a chance to see before lunch was Christian Baden Powell’s, Suruga-Dako with appliqué. 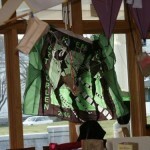 I could not even begin to comprehend what they were doing, but they were making really some beautiful kites. 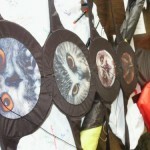 What a thrill it was to see some of the different designs and patterns that are possible in kite making. Lunch came to a close with its raffle in which I scored something I needed for my next class… A 14-foot bamboo pole! 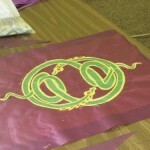 Very fortunate indeed, since I was taking Deb Cooley’s Yard Wiggler workshop and I needed a longer pole for the banner size I wanted to make. 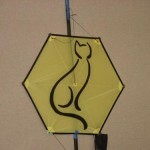 What a good sign, everything should work out, my sewing machine should not fail me, and I am actually going to make kites this year. I got my machine, brought it into the class and prayed everything was going to work out. She (my machine) did well at teasing me, as she decided to work for about 10 minutes and then promptly died. Thank goodness I already had a back up plan lined up for tomorrow! Deb took a look at the machine and decided it was a lost cause, offering me her own machine to use instead. Yes! There is still a chance to get something made. 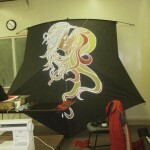 Working on my wiggler through out the class; I decided to go big (12 foot), so it took me a little while. 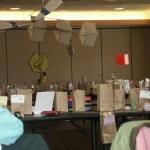 There were some beautiful and creative ideas that people came up with during the class. When it was time for dinner, I still needed to finish a couple of things, but Deb said that I would be able to go back and finish afterwards. Dinner went on as usual; chit chat, eat, raffle. I was anxious to get back to class and finish my yard wiggler as it would be the first sewing project I had completed and I was so excited! When everyone was done we headed back over to the classroom. There was not too much to be done, only to pin it and run the long stitch. I tried to stay focused as the end came near. When I put in the last stitch I jumped up from the sewing machine like a five year old and began to jump up and down screaming “I did it, I did it, I did it!! !” It truly was one of the happiest moments of my life as I stood there with something in my hands that I created. It really felt good. 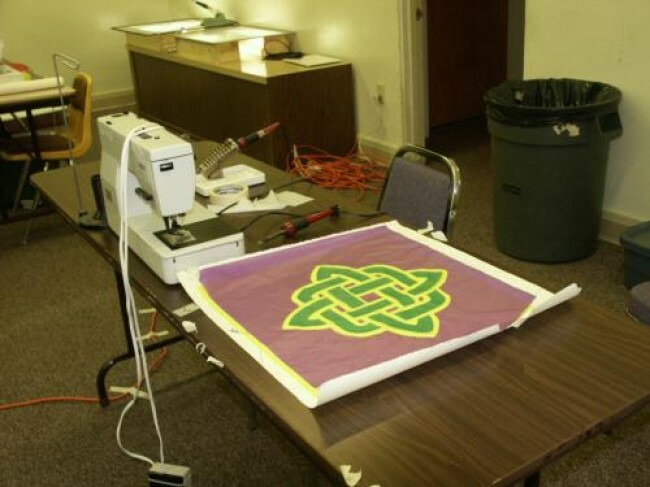 At that time Kay and Mike Woodring started setting up for their five-foot bol class they were teaching tomorrow and shared the pattern with me. It intimidated me for a little while, and made me a little concerned that I might have bit off a little more than I could chew tomorrow. Thanking Deb Cooley again for all of her help, I headed on my way. Back at the dorms I went to look for Mary Bos so I could get her sewing machine for tomorrow and meet with the Lady Kitefliers, she brought it out ahead of time to give me a quick 101 on using it. I was still a little scared, but I knew that people who are more than willing to help surrounded me. Miriam Schafler then showed me the arch that the Lady Kitefliers are working on for 2005 WSKIF as well as giving me the pattern so I could make one myself if I felt up to it. Oh joy, a project to work on when I get home! 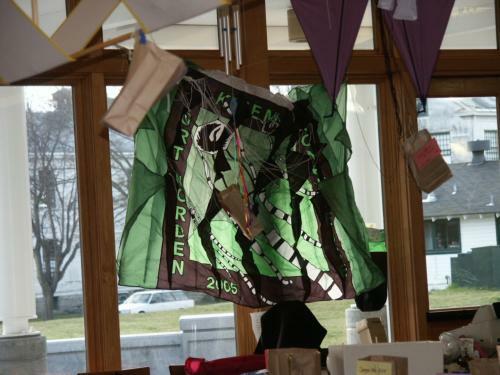 She also showed me some of the beautiful kites that she and Ellen Pardee have been working on with the Lady Kitefliers logo on it. I hung out and chit chatted with everyone until I realized that I would fall asleep right where I sat if I did not go to bed right then. I wished everyone a good night, thanked Mary once again and headed back to my dorm room. Today was a big day as the class that I was going to take had me a little nervous. I am not sure why, maybe just a little self doubt. I packed the sewing machine into the car and headed to breakfast. This year the raffle was treating me pretty well as I picked up a couple of items at breakfast as well. It was time, so off to class I went. I wandered to the Seminary building and started to set up my machine. I was going over what Mary had told me last night and hoping that I would remember everything. Picking out a color pattern for my bol, I bounced between a few different ones for a while and then decided to go with the green, white, and black. Looking at the pieces in my bag, part of my fear began to dissipate. It was new, but it did not seem as scary as it did yesterday before my first class. 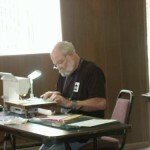 Taking the pieces out of the bag, I started to follow the instructions that Mike and Kay Woodring were giving us. The pieces would pair together, and it would just be a matter of us sewing them together and reinforcing them. Hey, I can do this! The first stitches I made with the Pfaff were like heaven. Wow, that was a nice machine. 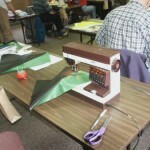 I followed the directions until it was lunch time, piecing the kite together and starting to see what the finished product was going to look like. By lunchtime I was half way through my project and felt that I was going to be able to accomplish the project in time for dinner. It was hard to stay focused at lunch when all I wanted to do was see what the finished product was going to look like. I ate, talked and waited with anticipation during the raffle. When things were completed we headed back to the classroom to complete our projects. 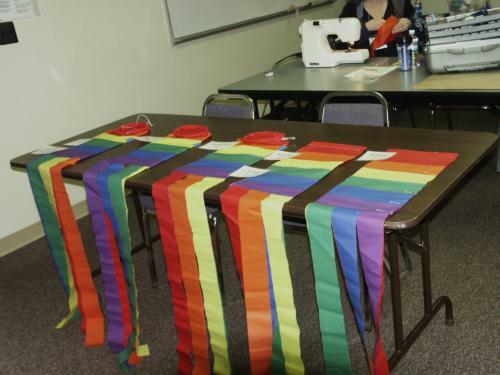 Putting mine together I noticed the various sewing skill levels in the room and felt motivated. I just kept following directions, asking questions when necessary, and then moving on to the next step. As dinner approached it looked like I would be done with my project in no time. 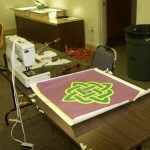 That was when the sewing machine started to act strange. It was doing things that I cannot explain, and I am not even sure why. Eventually we put in a bigger needle and it liked me again. Time was coming to an end quick, and I was doubting if I was going to be able to get it done before dinner. 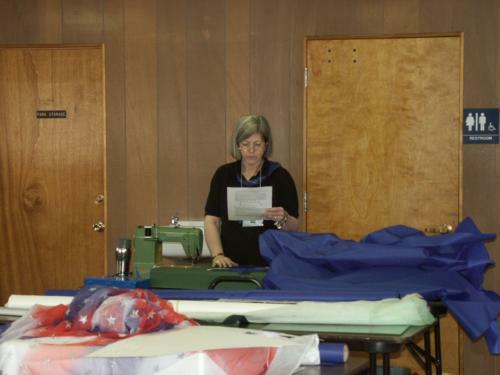 Kay was just as determined as I was, helping me to put the finishing touches on it as she showed me how to manage the large amount of fabric we were working with. I worked calmly and quickly as my time was ebbing away… Would I make it? Oh yes, I would. I put the last stitches in and brought it to Kay, and then began to put the bridle on it. Another success story, one more project finished for the weekend. Mike then put a line on the kite and flew it while Kay took a picture of me with it. I was just as excited about finishing this project as the first. With us having worked a little past dinnertime, they said that I could come back and get my things after dinner. Dinner on Saturday night is a huge deal as it is the BIG raffle. At all other meals there were usually only a grouping of raffle tables near the front (lets say 3 long tables), and every now and again a few round ones. 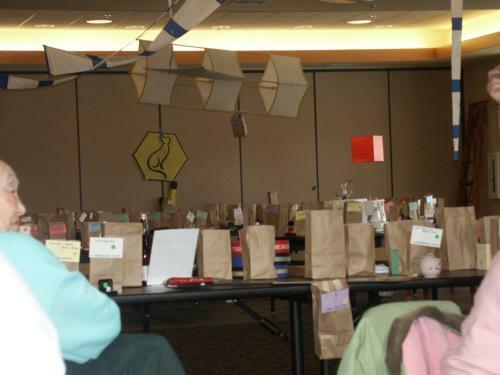 The raffle that goes on Saturday night has at least that many tables, plus 6 or more round ones, and includes all of the large kites that have been hanging around the room for the past few days. 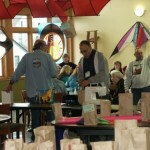 It was the raffle everyone was waiting for, and the ticket sales showed it. The room was full of the sound of the classic “Bazzer” stamp as everyone makes their last minute purchases for the evening, testing their luck on something special. I also got a little crazy and purchased some more tickets for the evening. All in all the raffle gods have shined down on me, so why stop now? This year’s raffle was good to me and it will encourage me to spend more on it next year and also find what I can donate to the cause. 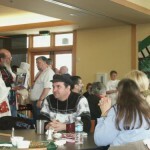 It was at this meal that they announced that Steve Millspaugh would be retiring from his role as the organization’s president, and shared with him a 2006 package for him and his wife Judy to attend next years Fort Worden. After dinner I went back to the seminar room and packed up all my stuff. I thanked Mike and Kay for the experience I had in their class, hugged them both and went on my way. Saturday night was an evening of hanging out with friends and meeting new ones. We went to check out the beach and then the cold chased us into the dorm rooms, then eventually we found ourselves in the lounge area. It was nice to make the acquaintance of Tim Elverston and Ruth Whiting, a fellow Portlander named Amalia, and get to know Jim Cosca a little better as well. Looking at the time we wondered if we were keeping anyone up, but at around midnight a bunch of people walked into the dorms having just finished their kites. Guess we were not the only ones still up! At around one in the morning I dropped everyone off where they needed to be and then headed to bed for my last night at the Fort. Sunday was a fun morning; I had to make sure to pack everything, as I had to check out of my room around breakfast time. It wasn’t that bad, since I could throw everything into the rental car and not worry about it. 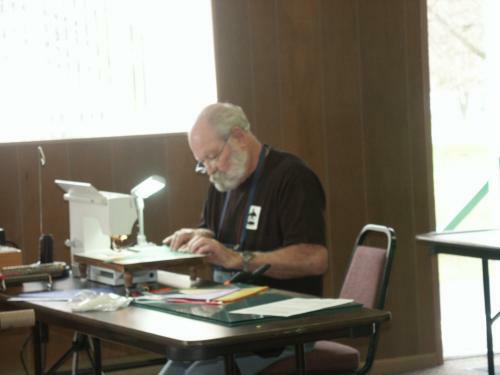 I returned Mary’s sewing machine since the last class that I was taking would not require it. Then I decided that I would have everyone sign the Tyvek apron I won at one of the last raffles… Luckily Rhonda had come prepared with a bag of markers which I put on the table, encouraging as many people as I could to sign it knowing that I would have one more chance at lunch. Breakfast was over and it was off to Ruth Whiting’s Wiggle My Squiggle class, whom I had the pleasure of meeting and getting to know the previous night. 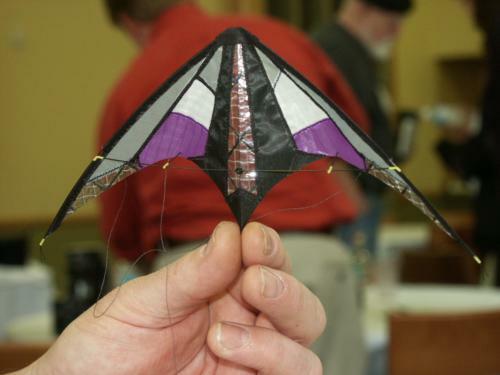 Ruth’s kite design was very unique, a different approach to kite building, and the materials that she uses are almost fragile. 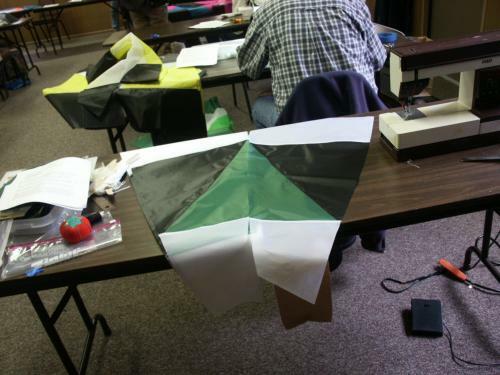 It was a thin plastic for the sail and a very thin spar material which was easy to break… I should know, I did! The design itself is beautiful. 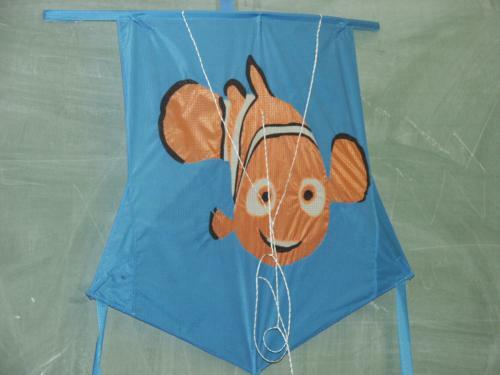 When the kite was finished it just wanted to fly, as it lifts right into in the sky on the slightest puff. 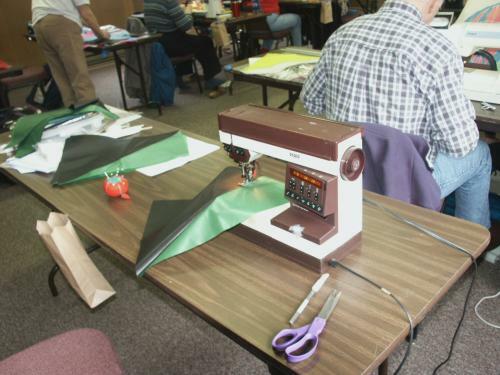 Ruth had taught another class on Friday where they painted the fabric of the same kites that we made on this other half a day class. 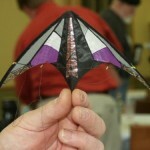 Another kite complete, and so different from the rest. 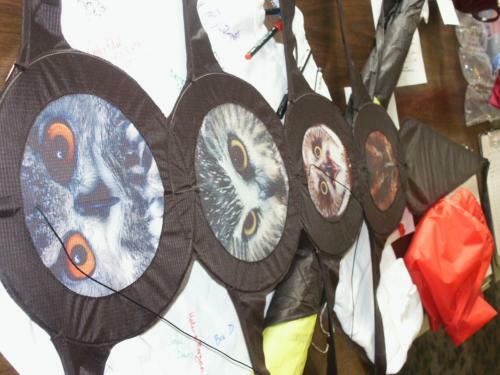 Another great feeling of accomplishment, three classes, three kites, what an all around good trip to this year’s retreat! Ah, the final meal at Fort Worden. Always hard knowing that the fun adventure and experiences are coming to a close. I ate my lunch and began to take my apron to various tables so I could make sure to have as many last minute people sign my memorabilia from the weekend. I always hate to say goodbyes, but the time has finally come. What a wonderful time it was this year at Fort Worden. I had the opportunity to build things with my own two hands and see that amazing things that I am capable of making. I look forward to trying my hand at some other projects as well in the very near future. 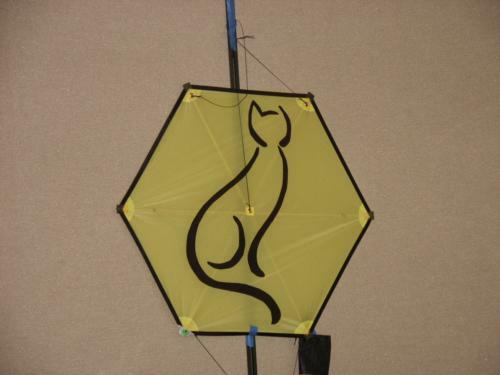 For anyone who has ever thought about building a kite, look into attending the 23rd annual Fort Worden conference scheduled for March 3-5, 2006. It will be an experience that you never forget. 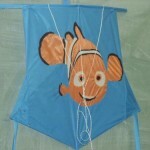 Also for more information take a peek at www.kitebuilders.org. See you next year Fort Worden for more adventures and feelings of accomplishment! 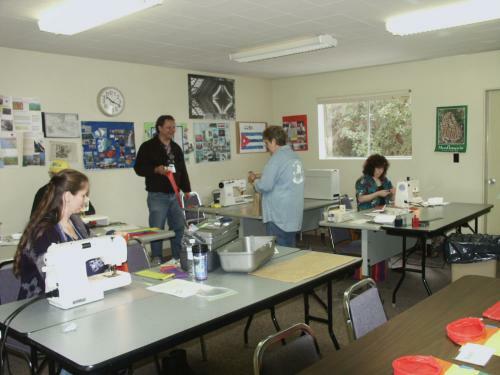 This entry was posted in 2005, Events / Festivals, General Topics, Issue 41 (Mar/Apr), Kite Making, KL Archive, Reports and tagged fort worden, kite building, kite making.